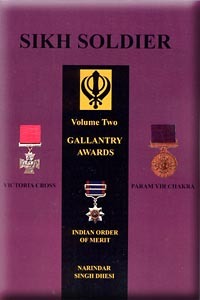 Sikh Soldier; Gallantry Awards This book, written by Narindar Singh Dhesi, documents Gallantry awards won by the Sikh soldiers, prior to and following India's independence. Through these listings, Narindar Singh Dhesi pays tribute to the courage and self-sacrifice of the Sikh soldiers. He has meticulously researched his material and there is not a similar book in this genre available that provides as much detail and information. The annals of Sikh history are replete with examples of gallantry on the battlefield, but the gallantry awards earned by the Sikh soldier have never been collated and documented in one volume. It is an important and vital addition to the collections of avid aficionados of Sikh martial history. After a dedication to the Sikhs, the introduction gives some background to the types of decorations awarded, and then explains the origins of the Nishan Sahib, the holy flag of the Sikh faith and the Khanda, which is the symbol shown on all Sikh flags. On the next page is listed the Indian Military ranks and their British equivalents. The remainder of the book takes the reader through the various gallantry awards, starting with the highest decoration - the Victoria Cross and ending with the Indian gallantry award of Shaurya Chakra. The Indian Order of Merit was the highest gallantry award available to Indian soldiers between 1837 and 1911, after which the eligibility for the Victoria Cross was extended to Indian officers and men. The Indian Order of Merit was removed when India became independent in 1947 and when it became Republic in 1950 it instituted its own gallantry awards - the highest being Param Vir Chakra. The Victoria Cross (VC) is the highest recognition for valour "in the face of the enemy" and the next few pages of the book pay homage to the five Sikh soldiers who received this prestigious award. Nand Singh was the only Indian soldier to be awarded both the Victoria Cross and Mahavir Chakra (MVC), which is the second highest military award for valour in India. Sepoy Ishar Singh earned a unique "peacetime" VC in 1922 for his gallantry and devotion to duty. The author, Narindar Singh Dhesi has dedicated a page to each of the five courageous men and he graphically describes the battle that each one fought and the circumstances that earned them the Victoria Cross. Narindar's painstaking research has enabled him to catalogue the Sikh who were awarded medals for gallantry and provides and informative description of the relevant battles. Particular mention is made of the Battle of Saragarhi. This battle took place in September 1897 when 21 men of the 36TH Sikhs regiment gave up their lives in devotion to their duty. In keeping with the tradition of the Indian Army, they fought to death rather than surrender. The Battle of Saragarhi is one of eight stories of collective bravery published by UNESCO and has been mentioned as one of the five most significant events of its kind in the world. These few men of the 36TH Sikhs wee killed while valiantly defending the signalling relay post at Saragarhi against the repeated onslaught of approximately 11,000 tribesmen. Each soldier from this epic battle was posthumously awarded the Indian Order of Merit. The fact that each member of that troop won gallantry awards in a single action makes it unique action in the annals of Indian military history. The book will be of great interest and use to those who wish to increase their knowledge of that particular part of military history.